A few years ago I wrote the following blog about what it feel like it feels like to have dementia. I have followed it today with what I have found to be some of the gifts of dementia, also written about previously in a number of posts, but also inspired by another online friend. Thankfully, so far, none of my online friends have turned out to be axe murderers or imaginary! 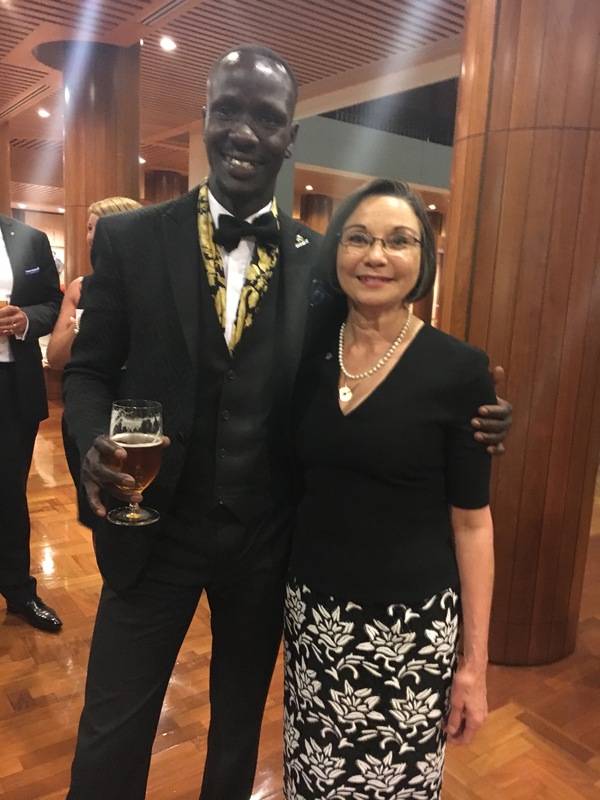 The photo is of me with Deng Adut, both at the 2017 Australian of The Year Celebrations this year; we are both state winners, and both proud Alumni members of the University of Wollongong. So, along with the negatives of dementia, there are also many positives, which I write about in the second half of this blog. But let’s start with a list of questions for those of you without dementia to think about, if you happened to be diagnosed with dementia, as this list may help you feel what dementia is like from the inside out, also written very eloquently about by my friend the late Dr Richard Taylor, Alzheimer’s from the inside out. These are just some of the things people with dementia are faced with each and every day, along with the intense isolation, the stigma, the discrimination, the loss of self and identity, the very prolonged and complicated grief, and the feeling that your world as you once knew it is disappearing right in front of your eyes. Would you like the idea that you are losing your ability to recall or remember your own life, your children, your friends, the things you did five minutes ago? Would you like being so confused you can’t navigate your way anymore, some days, not even in your own home? Would you like not being able to read any more? Would you feel upset about not being able to spell or write properly anymore? Would you like not being able to recall the names of artists, paintings, musicians, songs, places you’ve been before? Would you feel vaguely challenged not being able to speak properly, or at all? Would you feel inadequate not being able to do simple mathematics or use a calculator anymore? Would you want to live in an aged care facility, a home where you have no key to the front door, and a home where your rights are conditional and you have to become institutionalised? Would you like not knowing what to do in the toilet, or on the bus, or at the dinner table? Would you feel happy not knowing who it is on the end of the phone when you pick it up? Would you like losing your driver’s licence and having to rely on others for transport? Would you like not being able to go shopping alone anymore, let alone get yourself there independently? Would you like others to assume you are no longer competent at anything? Would you like to be 100% wrong, all the time? Would you like being confused about how to make a cup of tea, or in what order to shower or get dressed? Would you like it if people constantly challenged your diagnosis, with comments like, ‘but you don’t look sick’, or ‘your doctors must be wrong’, or ‘you can’t possibly have dementia if you can still function’? How would you feel if you were fighting hard to stay as well as possible for as long as possible, and someone said, ‘your wasting your time, dementia will get you in the end!’? How would you feel if you were referred to as a symptom, e.g. a wandering or aggressive, rather than the person you still are – mother, daughter, friend, nurse, wife or husband? Would you like the fact you have been diagnosed with a terminal illness, and there is NO cure, not even on the horizon? This is an updated version on how it ‘feels’ to have dementia. As I try to describe how dementia feels to me, it is not so much the actual ’symptoms’ I think about. When I forget something or can’t recall the name of a person or a thing, I used to feel annoyed with myself and humiliated. When I walk around in circles starting jobs and often now never quite completing them, I can feel frustrated, and if others are home, I used to feel ashamed, embarrassed and humiliated. Many things happen when I am alone, but I rarely talk about them anymore, as most of the time now, they have simply become just a part of living with cognitive disabilities caused by dementia. But it is not like being woken up from a deep sleep, and it can feel like I am inside a Gravitron, one of those awful rides at the Annual Show, the one where you get in, stand leaning against the backwards sloping wall, and then it spins rapidly pinning you to the walls through the force of gravity until your head spins and you feel sick, or get sick. The head spin of dementia is not dissimilar to the Gravitron experience. I gave a title to my dementia journey – “My Unseen Disappearing World” – because most still cannot see the ‘paddling below the surface of the calm swan’, as I was working so hard to hide the symptoms of dementia. It is less than comfortable when others notice my paddling, but also can be a challenge when they don’t, as then they don’t believe you have dementia, which for many of us is an experience far worse than having dementia. Early after diagnosis my children used to jokingly introduce me to their friends as the Dementor in the family. In fact if you have seen the Harry Potter movies, the Dementors represent perfectly in a visual way how it feels inside, as if the dementia is sucking the life and goodness out of my soul. I have used that analogy almost since initial diagnosis, so when working on a presentation last year I decided to look up what the Harry Potter wikia site says; A Dementor is a Dark creature, considered one of the foulest to inhabit the world. Dementors feed off human happiness, and thus cause depression and despair to anyone near them. They can also consume, leaving their victims in a permanent vegetative, and thus are often referred to as “soul-sucking fiends” and are known to leave a person as an “empty-shell”. For me, this says it all. Looking for the positives of dementia can be difficult, but doing so forced me to face up to a few things and more fully explore my feelings. Sometimes when I blog about the tough stuff, my husband feels very upset, but he is also thankful that for now I am accepting of dementia and so willing to share it, as it helps him be more loving and supportive, and importantly, to understand the things I cannot or may not want to express verbally. If he came home and I was just angry or in denial, it would be a huge strain on our love and relationship. Throughout the maze of dementia, I would still like to be able to hide the symptoms of dementia, but that is not always possible, especially from my BUB. So as I explored further how it feels to have dementia, I think it boils down to a few constantly recurring feelings – confusion – frustration – humiliation – embarrassment – loneliness – isolation – anger or irritation (which can lead to denial) – a deep sadness – and last but not least, worry, because I am constantly faced with an ever changing playing field, never knowing what function is going to become impaired or lost tomorrow. I also have written about the more positive things, and this is an update of a previous dialogue between myself and another online friend from a blog called The Dementia Dialogue that was set up some time ago. Our continued dialogue stopped years ago as things changed in our worlds, but looking back at some of our questions and answers is interesting. Live every day as if it’s your last, just in case it is. Being born is a death sentence! Although many friendships with family members and friends have virtually dissolved, the friends and family who have stayed by my side are much closer to me now than before the diagnosis. This is because dementia has taught me to say openly how much I love and care for them, regardless of if they might initially feel a little ‘embarrassed’ by it. Not everyone easily copes with being told someone loves them, out loud!! I feel like we all have much deeper and more authentic relationships. When I wrote the blog titled I love you many family and friends, who had never shared how much they loved me before then responded. It also encouraged them to be more open with their own family and friends, or to seek a deeper understanding with people in their own lives who had not shown them the love they yearned for. Writing that blog was a positive response to a deeper personal growth, because of the diagnosis of dementia. On top of that, I have ‘met’ people who have become online friends, supportive of my journey, and through our conversations, I find new ways to either motivate myself, understand more than my side of the coin, or new ways to respond or behave. Some of you have even gone from being imaginary friends or possible axe murderers to ‘real’ friends, as pictured above! Thank you. Another positive is I am now focused on my health as if it is the ‘Olympics training of my life’, and wonder why it has taken this diagnosis to make me more serious about it. I’ve also become a regular blogger, a published poet and author, and an advocate and activist for improving things for people with dementia and their loved ones, and really feel like my effort is not only worthwhile, it is making a difference. As we all strive to seek a deeper understanding of our contrary worlds of dementia, we will develop learning way beyond text books, and far outside of our individual experiences. This is not only learning for ourselves, but we are willingly baring our hearts and souls, sharing it with the global dementia community. June 1, 2017 in Daily Blog, Dementia, disAbility Rights, Human Rights, Living beyond dementia™, Prescribed Disengagement ®, Stigma. Tags: Author: Kate Swaffer © 2017, How would you feel being diagnosed with dementia? As I struggle to understand what my mother is going through, your inner thoughts are SO VALUABLE to me, Kate. Even though she can’t explain it, I know that she’s feeling all these emotions and frustrations as well. It’s important that we caregivers are reminded constantly of the inner struggle, and what my Mom calls “the fog” that moves in and takes over her mind. On bad days, she wants to end it all, and my heart aches for her. Reading your comments and the advice from wise caregivers has made a huge difference to my approach. Thank you for your courage in sharing. Beautifully said! Sharing with friends and family. Thank you for teaching us how to understand this life from the perspective of young onset dementia. Your work is making such a difference to the world – how inspiring you are! You’ve used some great words do describe how it feels to have dementia Kate …. some others – physically and emotionally painful, unfulfilling, tedious and LONELY LONELY LONELY. Thankyou Kate that was very enlightening, I read all your blogs and you should be proud of yourself,Rhonda. As always you constantly inspire me dear Kate. Without you, my views and my outlook on caring for people with dementia would forever be just that. YOU are the hero in my picture, because you validate and support my ongoing attempt to only work from the premise and the viewpoint of the person living with dementia. As I always say to you, you are the true expert here, and therefore my hero. No cognitively aware person can ever dispute that – it is a totally futile argument to even suggest that we know better, besides being totally disrespectful. And just to add another point to your list of some of the positive aspects of dementia – one of the greatest positives my friend is again YOU. – you having dementia has created a person who leads in a way no one else has the capacity to. If you ever feel down and despairing always know how many people admire you for your courage and drive and for being the person advocating for those that live with dementia. You teach us all so much and that can only be seen as a big fat massive huge positive. As always the pleasure is all mine, my friend. We angels gotta stick together – have a glorious weekend and keep smiling. wonderfully balanced blog entry. Kudos, my friend 💜. Thank you so much for the voice you provide in your journey. My Dad dealt with Alzheimer’s for about 8 years, and I can only describe it as a big learning period for all of us. We learned so much about being more patient, more kind, and more loving. And Dad dealt with it the best way he could. There was no point in time that I didn’t love him–it was just difficult to watch what he was going through. But we always knew how much he loved us, and that was so important to him and to us. Kate, I’m wishing you the best in your journey as well. Prayers and hugs.